A rave review in Publishers Weekly! A Magical New Audiobook Takes Flight! Best Audible Original Pick! The English American audiobook joins a Nobel laureate, President Obama and Jane Fonda on Audible.com’s Top Twenty list of best author narrated audio books of all time! SUNDAY, May 31ST, 2015 – A Mad Hatter’s Tea Party to celebrate the release of Alice in Wonderland & Through the Looking Glass the 150th anniversary edition, narrated by Alison Larkin at Edith Wharton’s home, The Mount! Alison wins BEST AUDIOBOOK OF THE YEAR award for her narration of Consider the Fork. Alison narrates the beautifully written Somewhere in France by Jennifer Robson and records My First Video Selfie. A VOGUE most powerful book of the season. 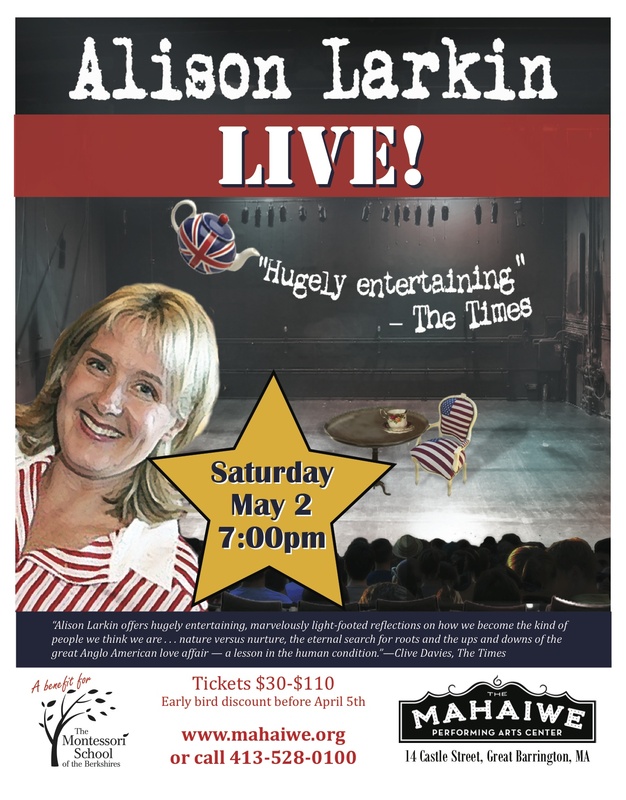 Springing from her internationally acclaimed one woman show, in her hilarious, poignant first novel, Anglo-American writer/comedian Alison Larkin draws further from her experiences as an adopted English woman who finds her birth parents — and a new homeland — in the United States and weaves them into a compulsively readable work of fiction. Since Alison won the Audiofile Earphones award for her own novel, The English American, (Brilliance Audio, April 2012) and the 2012 Best Non-Fiction award from Audiofile for her narration of Consider the Fork by Bee Wilson. Alison has narrated over eighty audiobooks. Recent narrations include Pride and Prejudice by Jane Austen, Don’t Want To Miss A Thing by Sunday Times best selling novelist Jill Mansell and Fool Me Twice by Meredith Duran. Click here to watch a short video of Alison talking about some of her favorite narrations. Alison sings the DNA song at the end of a Keynote Speech to a standing ovation. Watch more videos on Alison’s Youtube Channel.